We are very excited to share the general availability (GA) of Avere vFXT for Azure. This culminates months of effort beginning when Microsoft welcomed Avere to the Azure family earlier this year. Customers can now leverage the Avere vFXT to run their high-performance applications in Azure. The scope of Microsoft Azure’s solutions for high-performance computing (HPC) continues to broaden with Avere vFXT being the latest product to transition from testing to general availability. Avere joins a stellar portfolio of products like Azure Virtual Machines, Azure Batch, Azure CycleCloud, and networking technologies such as Azure ExpressRoute, that helps bring these demanding projects into the cloud without sacrifices. Since public preview began in late August 2018, customers across the globe have moved new workloads to Azure using our high-performance file caching technology. The Avere vFXT has been deployed at scale, providing data access at very low latency, no matter where the file data originated. 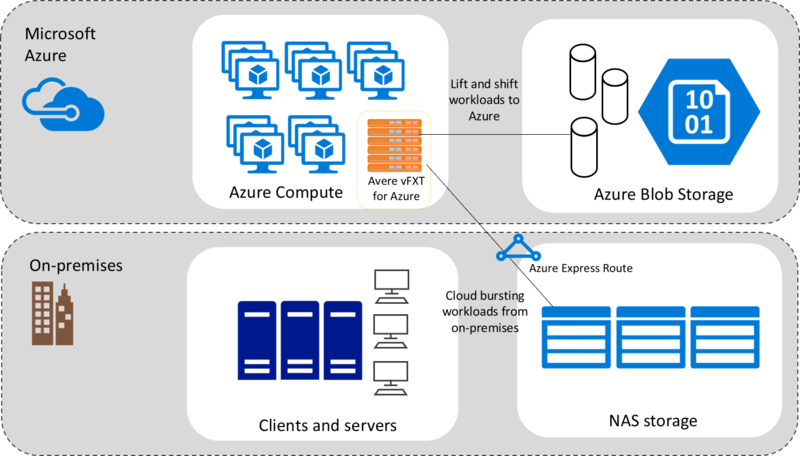 The Avere vFXT is deployed as a set of Azure Virtual Machines, adjacent to your cloud-based HPC cluster. The software runs as a cluster of VMs, enabling very high scale and throughput capacity for compute clusters of any size. Sources of storage can also connect into the Avere vFXT cluster — whether located in a datacenter, an Azure blob container, or both. This flexibility offers customers the option of running compute pipelines “as-is” in the cloud while planning longer-term data migration into the cloud. The Avere vFXT for Azure provides a blob-backed cache in Azure as well, facilitating migration of file-based pipelines without having to re-write applications. For example, a genetic research team can load reference genome data into the blob environment, further optimizing the performance of their secondary analysis workflows. Hybrid Cloud with Avere vFXT for Azure. HPC environments frequently require thousands of machines running concurrent operations against a like set of data, which can induce bottlenecks at the storage level. The Avere vFXT for Azure overcomes this by caching data closest to the computing, allowing for scale-out performance by running workloads on Azure Virtual Machines. Avere vFXT creates a performance tier away from the NAS, shielding it from having to field the concurrent requests. The Avere vFXT for Azure can greatly lower latency by eliminating the need for frequent roundtrips between compute and on-premises or blob storage. The Avere vFXT runs as a cluster of VMs, enabling very high scale and throughput. The software enables workloads to run across hundreds or thousands of virtual machines. Run HPC jobs in Azure without having to worry about where the data ultimately resides. Avere vFXT provides low-latency caching access to your on-premises NFS network-attached storage (NAS) environment while you determine your longer-term data management strategy. Avere vFXT caching lowers your overall storage costs presenting only the data specifically requested by your workload. Using this approach means you don’t have to copy large amounts of data along with what is needed for the job. In addition, the Avere vFXT for Azure has no charge associated with licensing. Users costs are only for the underlying Azure assets used to run the Avere vFXT software. The Avere vFXT for Azure is available today in the Azure Marketplace. For best results, contact your Microsoft team or partners involved to help you build a comprehensive architecture that meets your business objectives and delivers results. Also, if you are heading to Dallas, Texas for SC18, you’ll find Avere experts at the Microsoft booth ready to help you accelerate file-based workloads in Azure!